Remove region code (1-6) from DVD and rip DVD to digital (MP4, MPEG, FLV, WMV, MOV etc.) with high quality for playing on PC, Mac, iPhone, Android etc, with ease. It is also available to bypass other DVD copy protections like CSS, UoPs, Sony ArccOS and so on. Both PC and Mac offer an option to change region code of DVD drive making it have a matching code with DVD. It makes easy to watch a foreign movie DVD on computer. Now, let's follow the guides to change region code on DVD disc in Windows and Mac. The region code of DVD drive on Mac will be automatically set as the DVD you play at the first time. Once you insert a DVD with a region code which doesn't match the current region code of DVD drive, it will ask you whether you want to change the region code. Both Windows and Mac have a limited number - 5 - of DVD region code changes. After you have reached the maximum change, the region code will be kept as the last code you set even if you reinstall operation system. Step 2. Select an output format by clicking "to MP4" or other tabs. Audio and Video Setting panels appear. You are allowed to change audio quality, sample rate, volume and video quality, frame rate, aspect ratio and resolution to achieve better playback effect on player or device. 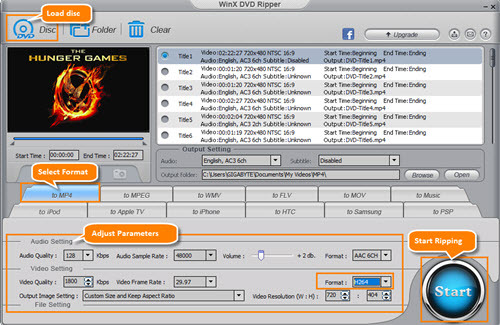 WinX DVD Ripper Platinum is an expert DVD ripper excelling at ripping both unprotected and protected DVDs to MP4 (HEVC/H.264), MKV, MPEG2, AVI, MOV, FLV and other formats. Apart from region code, CSS, RCE, Sony ArccOS, it can also circumvent advanced DRMs used on DVDs released by Disney, Warner Bros., 21th Century Fox etc. as well as workout DVDs or more. Hardware acceleration taking full advantage of Intel QSV, NVIDIA NVENC helps produce the No.1 fast speed to rip a DVD while keeping a high quality, almost lossless. Free download WinX DVD Ripper Platinum to rip your DVD collection in a breeze. How to Play USA DVD in UK Free, Play Region 1 DVD in Region 2 etc.